The Government on Monday finally approved the implementation of guidelines for the defence Strategic Partnership model that encourage domestic private as well as foreign firms in military manufacturing in the country. And the first project to kick off the long-delayed Strategic Partnership policy will be 111 utility twin-engine helicopters worth an estimated Rs 21,000 crore for the Indian Navy. The decision to implement the policy was taken at a meeting of the Defence Acquisition Council — the highest decision-making body on procurement. Defence Minister Nirmala Sitharaman led the meeting. The model promulgated in May 2017 seeks to identify Indian private firms to be designated as Strategic Partners. Apart from allowing private manufacturers, it also keeps the door open for defence PSUs and the Ordnance Factory Board to tie up with foreign original equipment manufacturers to make big-ticket military hardware. In the initial phase, the selection of such partners would be confined to four segments: Fighter aircraft, helicopters, submarines, armoured fighting vehicles and main battle tanks. In each segment, only one partner would generally be selected, according to the policy. The model aims to revitalize the defence industrial ecosystem and progressively build indigenous capabilities in the private sector to design, develop and manufacture complex weapon systems for the future needs of the Armed Forces. “The amplifying guidelines lay emphasis on incentivisation of transfer of niche technology and higher indigenous content. 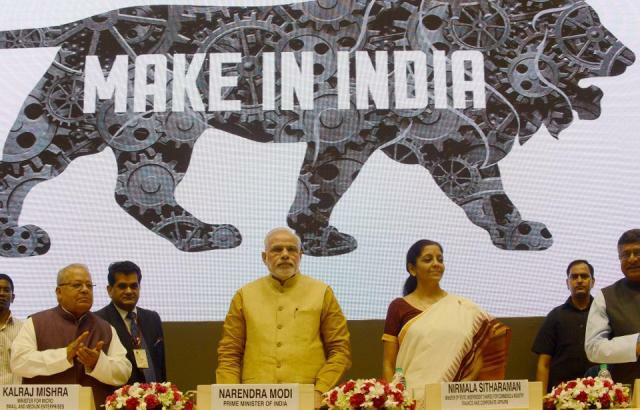 The spokesperson said the move would give a “major fillip towards encouraging self-reliance and aligning the defence sector with the “Make in India” initiative of Prime Minister Narendra Modi. In an endeavour to convert policy into implementable directions and to kick off the process, the council also approved platform specific guidelines for the procurement of 111 naval utility helicopters. That ends the Indian Navy’s hunt for a replacement to its ageing fleet of single-engine Chetak helicopters operating from warship decks. According to defence sources, 16 helicopters would be procured in fly away condition from a foreign vendor and the remaining 95 will be built in India by an Indian partner through joint ventures and technology transfers. “All procurements under the SP model would be executed by specially constituted Empowered Project Committees (EPC) to provide focussed attention and ensure timely execution,” the spokesperson said. The DAC also approved the acquisition of eight fast patrol vessels for the Indian Coast Guard under the “Buy Indian Designed, Developed and Manufactured” category at an approximate cost of Rs 800 crore. “These vessels will be indigenously designed and manufactured and will strengthen maritime security by undertaking day-night patrolling and policing of the maritime zones of India,” the spokesperson said.